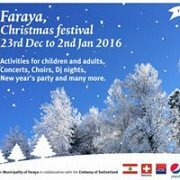 This year Christmas & New Year 2016 are so special in Faraya. Activities for children and adults, Concerts, Choirs, Dj Nights, New Year's party and many more... Starting 23 December ending 2 January.